in California during the 2007 DCI World Championships. Drum corps fans from throughout the western United States will have an early season taste of the East and Midwest, as the Cadets and Phantom Regiment are preparing to make a West Coast haul in June of 2011. "We are excited and glad to be heading out west again as the members of the corps always enjoy that tour," said Phantom Regiment Executive Director Rick Valenzuela. "Our West Coast fan base will have the chance to see the Regiment numerous times as we'll be participating in as many of the DCI Pacific events as possible." This will be the first time Phantom returns to the Golden State since 2008, and their seventh in the last 30 years including other trips in 1981, 2003, 2004, 2005, and 2007 for the DCI World Championships. The Cadets on the other hand will be making just their fourth trip to California since DCI's founding in '72. 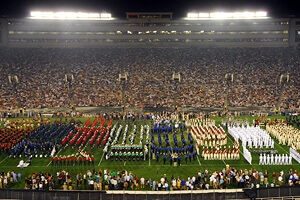 First touring California in 2001, the corps returned in 2004 for Drum Corps International's Tour of Champions exhibition events, before 2007 where they finished second in Rose Bowl Stadium at the World Championships. "It's been a few years, and with the chance to spend time in San Francisco, Seattle and the beach, the members will have a great time while also bringing our act to our friends and fans from the West," said Cadets Director George Hopkins. The two corps are currently scheduled to join the lineup of Pacific corps beginning the third week of June, making their way through the Southwestern U.S. before touring California and the Pacific Northwest. Highlighted cities tentatively include Clovis, Stanford and Stockton, among others. "We look forward to seeing the Blue Devils and Santa Clara in their backyards," said Hopkins. "It will be a great beginning to a fabulous summer." The complete 2011 Drum Corps International Tour Schedule will be released in late November on DCI.org.